Autism Spectrum Disorder is one of the most researched and popular topics in the fields of psychology, psychiatry, and special education. In the last 30 years the amount of new information on assessment and treatment has been astounding. The field has moved from a point where many considered the condition untreatable to the current position that it may be curable in some cases and that all persons with this condition can benefit from treatment. Intervening with school age children continues to be a major focus of assessment or intervention. However, expanding the ages of those receiving more attention from younger children to older adults, is becoming more prevalent. The consensus is that intensive treatment at the earliest recognized age is critical and that many adults evince symptoms of the disorder and warrant care. The field is full of many proposed treatments many of which offer promise but no data. Thus, a book on evidence-based assessments and interventions, across the life span should be of value in helping to sort out the more credible interventions as defined by the research and what methods have the best support. Given the popularity of the topic and the vst array of potential assessments and teratments available, this volume will be aimed at delineating what the researchers have shown has the best evidence to support particular methods. International Review of Research in Mental Retardation is now available online at ScienceDirect — full-text online of volumes 23 onwards. 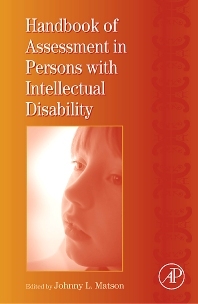 The audience for the book will be researchers, clinicians and graduate students in psychology, special education professionals, social workers, and psychiatrists. This book could be viewed as a supplemental text for graduate cources or a resource book for researchers or practitioners.